Now that the public face of nihilism has increasingly become ruddy, well-fed, and bellowing in a country-fried accent something about how compromise is a Judeo-Bolshevist invention, it’s hard to remember that there once was a time when our cultural image of an adherent to this most ridiculous of philosophies was altogether different. Sleeker. Cooler. Artier. German. 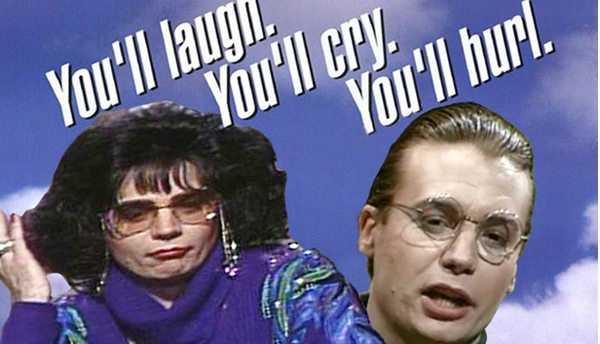 Nobody embodied—or satirized—that Platonic ideal better than Dieter, the iconic SNL character sprung from the mind of Mike Myers, which was arguably the most fertile terrain in ’90s comedy, populated by various charter members of various hilariously specific subcultures, each of whom had somehow been selected to host their own talk show. Dieter’s show was Sprockets,a virtuosically bizarre rendering of what might happen if Klaus Nomi was the host of Crossfire, involving disturbing black-and-white video, a mysterious monkey that favored guests were exhorted to touch, and of course, “the time on Sprockets when we dance” a jerky assemblage of geometric movements that would not be out of place in a Merce Cunningham piece. Despite, or perhaps because of, his cultlike appeal, Dieter never reached the dizzying heights of Wayne Campbell, Myers’ most famous SNL creation, having been denied a starring role in his own feature film. Such a project was green-lighted in 2000 and set to feature then up-and-coming new talents Will Ferrell and Jack Black in supporting roles and looked to be yet another smash hit waiting to happen. Until, that is, Myers unexpectedly pulled out, citing unresolvable issues with the screenplay (which he himself had written, no fewer than 14 times) and triggering a series of lawsuits that, depending on what you thought of The Cat in the Hat, effectively ended his non-Shrek film career. The script was shelved, never to be seen again by human eyes. That is, until now. Comedy news website Splitsider managed to get a hold of a copy and has kindly reported back, Harry Shearer-style. The verdict? Pretty good! Pretty, pretty, pretty good! A little dated, perhaps, but that’s to be expected, and given the unprecedented nostalgia of the pre-Millennials (i.e., we’re mostly too broke and depressed to make up our own art, so we spend a lot of time tearfully combing Tumblrs strewn with the detritus of our Elysian childhoods), not unviable in today’s marketplace. But why not really reach into the vaults? Maybe Dieter isn’t enough; maybe it wants to be a buddy picture. And for the role of Dieter’s buddy, allow me to nominate my favorite of Myer’s great triumvirate of sketch comedy creations: the big-haired, butter-adoring, Streisand-worshiping, mighty taloned Linda Richman, the host of “Coffee Talk.” Dieter and Linda. A buddy film reconciling postwar German Nishilism with postwar American-Jewish bagels and lox and buttah culture: There’s a truth and reconciliation committee for you. If you tell me you don’t want to buy your tickets right this minute, I’ll call you a damned liar (or, you know, under 30). Here’s the pitch: Conceptual artist Dieter, despondent over what he sees to be the detrimental effect of reality television breaking the last taboos (after the Kardashians, how can one ever be disgusted again? ), decides to make the most offensive piece of art ever made, after which he will commit suicide. To that end, he gathers Miley Cyrus, Terry Richardson, Paula Deen, and a small troupe of acrobatic dwarves in furry bear costumes and sets off for the Museum at Auschwitz-Birkenau, where he plans a remake of Jerry Lewis’ unreleased master-shonde, The Day the Clown Cried. He didn’t reckon, however, with running into the Temple B’nai Israel Synagogue Sisterhood delegation on their biannual heritage tour, led by one Linda Richman, who isn’t very amused by his project. They get into an altercation, Miley Cyrus is wounded, Paula Deen helplessly offers sticks of butter only to be told she is pronouncing it incorrectly and besides, they had flaishich for lunch, and eventually, both Dieter and Linda are arrested by overzealous concentration camp guards—excuse me, docents—on crimes of attempted assault and Holocaust denial.